Jazz Time is an unusual slot machine from Real Time Gaming. The old school jazz theme is presented in this slot by leaving the normal slot functions behind. There is no Autoplay or other complicated features or functions. It’s as simple as can be, just try to match the symbols on the 5 reels and 9 lines. The groove is the key here; there are some funky music tunes that are changing from one instrument to another depending if you match them. For example, if you hit some piano symbols, a piano tune will be activated. Before you start spinning the reels, you have to choose the coins that you want to bet per line. This is also very old school and classic. Some might feel its manual while other might think that Jazz Time is a great comeback of the classic slot machine. The graphics are great. The colouring and the design of both the game window and the symbols enhances the classic bebop atmosphere of the jazzy age. As mentioned above, the music tunes plays a big role in enjoying this slot machine. Each of the instruments has their own music tune. The overall impression is that the graphics and sound goes well with the jazzy theme of this slot machine. There are seven symbols in this slot machine. They all pay differently. Here follows the top to the bottom of the payouts; microphone, horn, guitar, saxophone, trombone, bongo drums and the violin. The scatter is different parts of the drum set. Once you have hit all three parts a scatter bonus will be rewarded. There are three different bonuses/jackpots in this game. The scatter bonus: When all three Drum Set symbols appear anywhere (drumsticks, snare, and hi-hat), they combine to make a drum set and award a scatter bonus. Jazz Time Bonus Round: When three Grand Piano symbols appear anywhere, they trigger the Jazz Time Bonus Round. During the Jazz Time Bonus Round, you click on an instrument to play it. When the instrument plays a tune in harmony with the bass line rift, you win a multiple of your original bet. When the instrument plays out of tune, the bonus round ends. 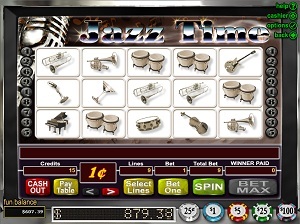 Jazz Time Progressive Jackpot: Jazz Time may offer a progressive jackpot where a five-credit bet on each of the nine paylines wins the jackpot if five Microphone symbols appear on a payline. The jackpot total is displayed above the reels. To play for the progressive jackpot, place a five-credit bet on each of the nine paylines. You may bet from 1 cent up to $5 per betting line in this slot machine. You configure your betting preference by using the casino coin buttons.